Things in Azure change very quickly. It happened more then once that I did lecture on some Azure subject and in next few days half of it was out of date. Same thing almost happened to me on November 23 when I did webinar for Microsoft on Linux/Windows VM deployment in minutes (it can be accessed on-demand). I opened Azure portal, started creating new VM… And there it was, new feature… New size of VM was available. Deployment finished and I wanted to explain all options that you have in portal to manage your VM. And there it was, another one…Auto-shutdown. Fortunately, I knew these features were coming so I could talk about them a bit. So in this post I will write about what’s new this month when it comes to Azure VMs. 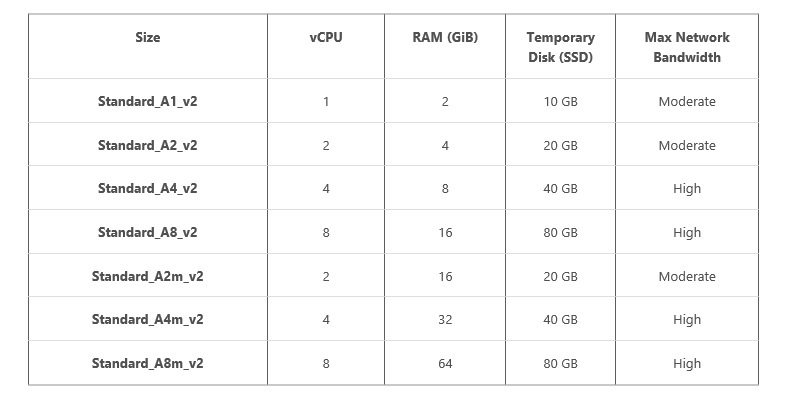 As I said, new size of VMs is available, A_v2 Series VM size. It was announced on November 22, day before my webinar. New A_v2 have a bit more memory (rounded 1.75 GB RAM to 2GB, 3.5GB RAM to 4GB etc.) and have faster disks (IOPS 2-10 times faster). There are available in most Regions and will be available in shortly. Next feature I run into was Auto-shutdown. This feature was announced on November 23, same day as my webinar. Auto-shutdown gives you option to shut down your VM automatically and save money by not spending resources in period when it you don’t have to. 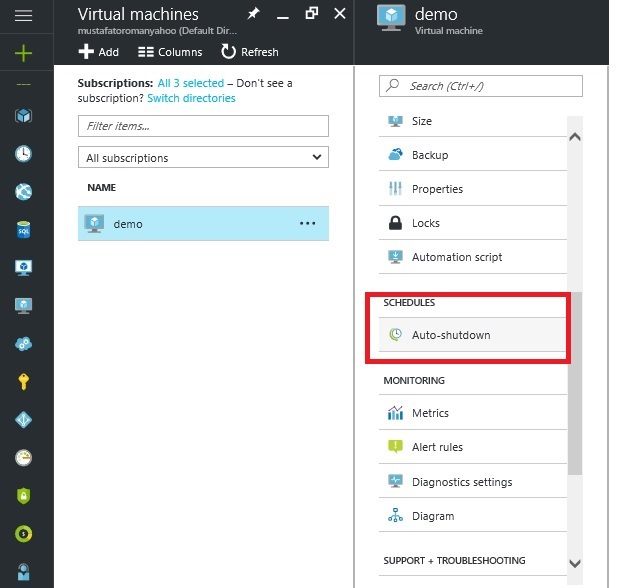 People confuse this option with automation process where you can use Azure Automation to set you VM only to work in business hours, starting it shortly before and shuting down after business hours (and cutting cost to 1/3). Auto-shutdown gives you option to shutdown VM but not starting it again and it was designed more for Test/Dev environments then for production. To set up Auto-shutdown, go to your VM and find Schedules. Click on Auto-shutdown. 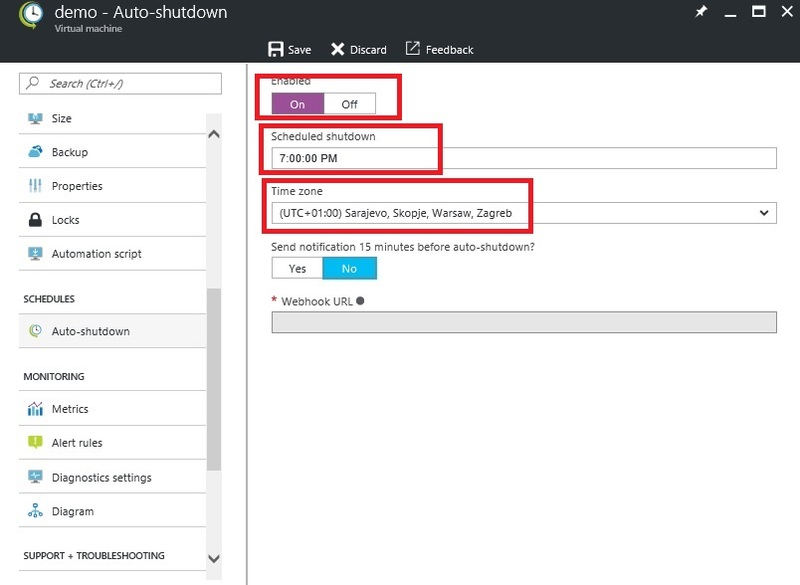 You need to enable Auto-shutdown, select time when you want shutdown to happen and time zone. Additionally, you can set it up to send notification 15 minutes before shutdown. 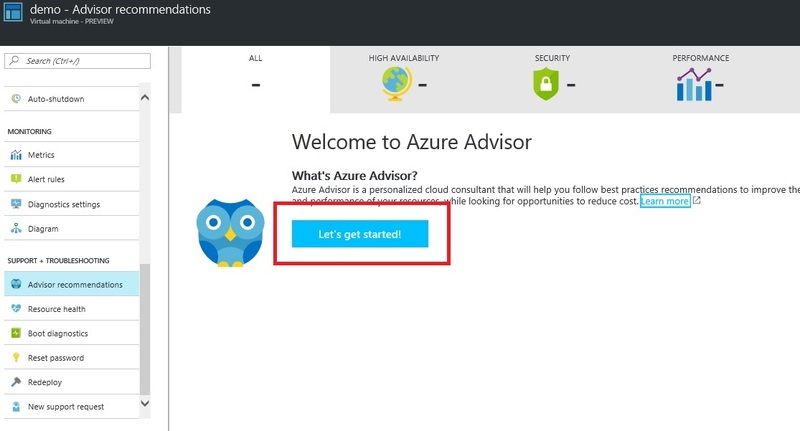 Third feature I’ll write about in this post is Azure Advisor. This feature was announced on November 17, a week before my webinar but it’s still very new. 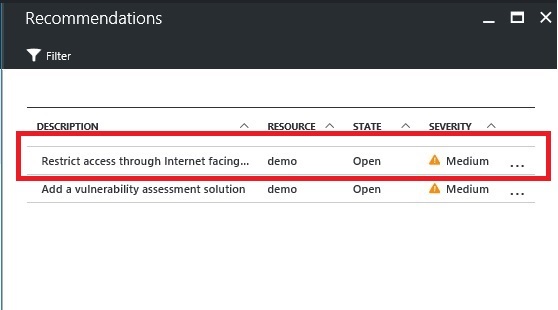 Azure Advisor does scan of your resources (it isn’t limited to VMs only) and makes recommendations what you should change to make it highly available, more secure etc. 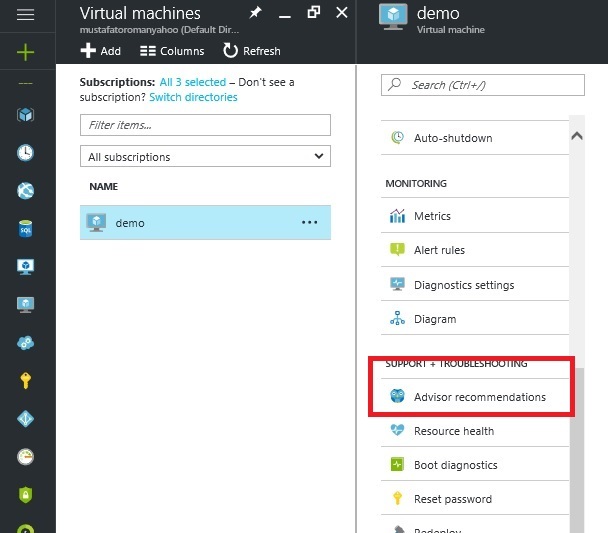 To run Azure Advisor, go to your VM and select Advisor recommendations under Support. Click on ‘Let’s get started!’ and wait for few minutes. Advisor will do quick scan of your resources and make some recommendations. In this case I got only one regarding security. If you click on issue, new tile will open with more info about issue. Click on issue and wait for new tile. Finally, you have detailed description of issue (in this case it NSG rule) and have button that will take you to resource that needs to be fixed. 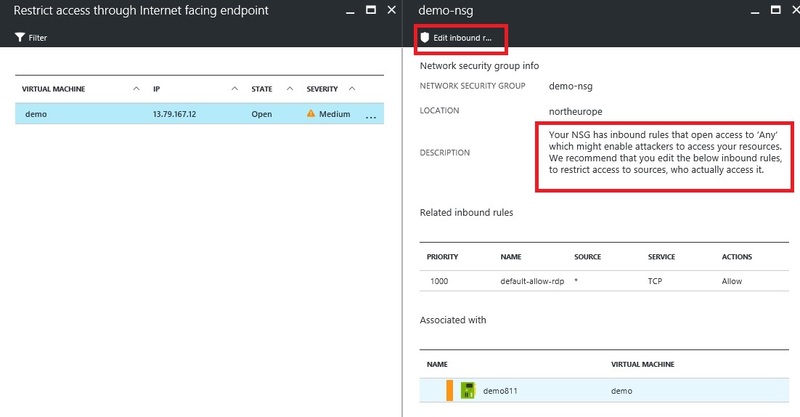 I found it a bit funny that Azure Advisor found default security rule (created for RDP when creating VM) as security issue but on other hand I understand, I wouldn’t allow RDP on my on-prem servers over internet. This Azure Advisor stuff is pretty cool!